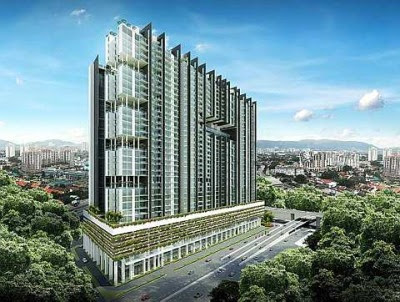 An artist’s impression of Icon City Petaling Jaya. Mah Sing Group Bhd plans to make its debut as a regional property player this year and hopes to kick off its first offshore project in China by year-end. Group managing director and group chief executive Tan Sri Leong Hoy Kum says the decision to hold back from venturing overseas earlier has been a blessing for the company as it has allowed Mah Sing to build up a stronger market presence locally. “We had planned to venture into China two years ago but decided against it after some careful analysis. On hindsight, this has proven to be the right decision and the company is in a much more comfortable position to do so now,” he tells StarBizWeek. To achieve its vision as a world-class regional developer within the next five years, Leong says Mah Sing has also set its sight on Singapore, Australia and Indonesia. Locally, the company has grown to be one of the most diversified property developers in the country with a broad product offering in the Klang Valley, Penang and Johor Baru. It has 34 projects (including five completed ones) in the residential, commercial and industrial segments. To support its sales target of RM2bil to RM2.5bil this year, Mah Sing plans to roll out between RM2.5bil and RM3bil worth of launches. Of this, some 36% will comprise landed residences, 32% will be service residences and small office home office (SoHo), 29% from commercial properties and 3% from industrial projects. Mah Sing's range of residential projects are marketed under the township Perdana brand, medium high to high-end Residence brand, and high-end Legenda brand. For high-rise properties, Mah Sing recently launched the M series M Suites and M-City, and Plaza series Garden Plaza in Cyberjaya. An artist’s impression of M-City@Jalan Ampang in Kuala Lumpur. Its latest project to be previewed, M-City@Jalan Ampang, attracted over 3,000 registrants for the designer SoHo suites, residential suites and sky villas. The RM920mil project features 1,200 units of residential suites, office suites and retail outlets, on five acres of freehold land. The first component to be previewed was the designer SoHo suites comprising single storey units with built up of 781 sq ft, 853 sq ft and 1,066 sq ft, as well as duplex units with built up of 910 sq ft and 1,330 sq ft. These semi-furnished residences have average price of RM800 per sq ft (psf). Based on a garden city concept, M-City boasts of over four acres of greenery with hanging gardens, lagoon parks and other thematic parks for residents. There will also be lifestyle retail outlets to cater to the needs of residents and tenants. The three-storey boutique retail shops has average lot size of 28' x 78'. According to Leong, Mah Sing is also making an impact in the commercial property sector, and is one of the few listed developers to offer industrial products through its iParc range of projects. Its latest iParc 3@Bukit Jelutong will comprise 25 units of 3 storey semi-detached bungalows with land size of 60'x132', built up from 5,339 sq ft and indicative price from RM3.3mil. They will be designed for 4-in-1 centralised functions, where the factory, office, showroom and warehouse can operate from one central location. Going forward, Mah Sing wants to build more street malls and retail malls. It has three street mall projects Southgate KL, StarParc Point Setapak and Star Avenue D'Sara, and two retail malls Icon City Petaling Jaya and Southbay City on Penang island. Since its launch in 2008, Southgate KL with gross development value (GDV) of RM458mil, has been 98% sold. Of the five blocks of lifestyle retail and modern office suites, two were sold en-bloc and the balance on strata. the building is expected to open for business in August,” Leong says. StarParc Point Setapak with GDV of RM129mil was launched in the first quarter of 2009. It is nearly 100% taken up. Fronting the upcoming Parkson Mall and Jalan Genting Klang, the covered lifestyle square will feature al-fresco dining outlets and boutique shopping. There are also the six-storey series comprising double-storey retail lots from 2,251 to 4,950 sq ft priced from RM1.3mil, while the four-storey offices of 1,264 to 2,715 sq ft are from RM295,000. Star Avenue D'Sara that fronts Jalan Sungai Buloh is one of the first new commercial projects along Jalan Sungai Buloh. Comprising 92 units of three- storey shop office priced from RM2.2mil, the RM402mil project was launched in April. Located close to the proposed MRT station in Taman Industri Sungai Buloh, the project is adjacent to the Rubber Research Institute land, has dual access from Jalan Sungai Buloh Shah Alam and Persiaran Cakerawala. As for retail malls, Icon City Petaling Jaya, located on 20 acres at the crossroads of Lebuhraya Damansara-Puchong and the Federal Highway, is Mah Sing's flagship project in the commercial segment. The project with GDV of RM3.2bil offers one of the best visibility in the Klang Valley. Under the first phase of the project, 30 prime lots comprising seven and eight storey lifestyle shop offices with wide frontage, high ceilings, quality finishing, private lifts and main road frontage, were recently previewed, of which 19 units valued at RM192mil were sold. The second phase of the project comprising two and three storey retail lots (with indicative price from RM3.6mil), small office versatile offices (from RM570,000) and residential units, are now open for registration. Leong says the development will also have a hotel, corporate office towers and a retail mall. Meanwhile, Southbay City on Penang island, located about five minutes from the upcoming second Penang bridge, will have commercial portion to the tune of RM2bil in GDV. The first phase of the project will comprise the RM265mil Southbay Plaza that will be ready for a preview soon. The residential suites with built-up of 1,030 to 1,645 sq ft will have indicative price of RM550 psf, while the lifestyle retail shops of 1,000 to 12,500 sq ft will be at RM500 psf. 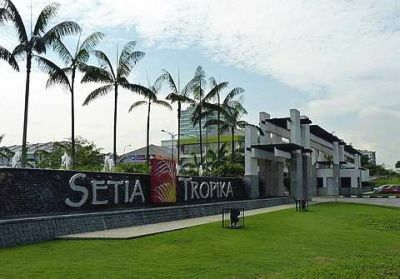 Setia Tropika, a mixed property development project in Kempas, Johor Baru by SP Setia. KUALA LUMPUR: Shares of SP Setia Bhd, the largest property stock on Bursa Malaysia, rose 5 sen to RM4.15 after meeting earnings expectation for the half way mark of its financial year with analysts confident the company would be able to meet its full year sales target of RM3bil. Sales for the second quarter and the first half had surpassed previous highs, and revenue for the seven months of its financial year ending October 2011 was already higher than any other full year except for its 2010 financial year. “Current unbilled sales have touched a record RM3.2bil following strong year-to-date (7 months) pre-sales of RM1.66bil. Setia is very much on track to meet its sales target of RM3bil,” said AmResearch in a note yesterday. CIMB Investment Bank in a report said some 57% of the sales came from the Klang Valley. “The four townships in Johor contributed huge sales of RM510mil or 36% of the total while Penang chipped in 7%. The Johor sales were very commendable, being an unprecedented RM1bil on an annualised basis compared with past sales of RM400mil to RM500mil per annum,” it said. Expected to drive sales this year will be the company's KL Eco-City project. HwangDBS Vickers Research in its note said KL Eco-City's RM1.8bil worth of bookings from boutique and strata offices and recent condo tower launch at an average selling price of RM1,200psf, which was a 40% premium to adjacent properties, should be converted soon, following the signing of S&P agreements from mid-June onwards with the completion of DBKL's land privatisation exercise. It pointed out that other launches to watch were V Residences and Brook Residences (with a gross development value of RM233mil), Fulton Lane@Melbourne with a projected GDV of RM1.4bil and Aeropod@ Kota Kinabalu (projected GDV of RM1bil but is awaiting approvals). “SP Setia will be one of the biggest beneficiaries of the mass rapid transit with 25% of RNAV exposed to potential interchanges ie KL Eco-City and Jalan Bangsar (near KL Sentral),” said Hwang DBS. It said SP Setia could be involved with more landbanking deals. Hwang DBS said SP Setia has been the most aggressive developer with four acquisitions year-to-date with a GDV of RM15bil. AmResearch expects land acquisitions to be the primary valuation driver. “Based on its township track record, SP Setia would be the leading candidate to co-develop a parcel of the prime residential land in Sg Buloh with EPF-owned Kwasa Land, leveraging on its successful Eco Park brand,” it said. “We are expecting stronger newsflow on this front in the next few months. It is also bidding for the 100-acre seafront land in Bayan Mutiara, Penang believed to be valued at over RM900mil including reclamation cost, and a potential GDV of over RM5bil,” said the report. KUALA LUMPUR: Property developer, Mutiara Goodyear Development Bhd expects to launch several mixed development projects amounting to RM1.3bil in gross development value (GDV) this year, said its executive chairman Hamidon Abdullah. Among the upcoming launches are Nadayu 28 Sunway, Nadayu 290 Penang and Nadayu Cyberjaya, Hamidon told reporters after the company's annual general meeting here yesterday. “We have successfully launched Nadayu 92 in Kajang with overwhelming response. We launched 286 units of link houses, four units of bungalows and 24 units of semi-detached homes,” he said. According to Hamidon, the Nadayu 28 Sunway project meanwhile will comprise 10 units of shoplots and 411 condominium units while Nadayu 290 will have 142 units of condominiums and seven units of villas. The company which has vast experience in commercial and residential developments currently has a land bank of 876 acres. Asked on the proposed change in the company name to Nadayu Properties Bhd, Hamidon said it was part of its branding strategy to establish the Nadayu brand for all its property development projects. It would be in line with the group's objective to maintain strength and value in product quality, project execution and timely delivery while it pursues its vision of becoming an innovative property developer in the local and global market, he added. KUALA LUMPUR: Property developer Mutiara Goodyear Development Bhd plans to build commercial and residential units worth some RM1 billion on a 1.4ha site along Jalan Sultan Ismail here. Last week, Mutiara Goodyear told Bursa Malaysia that it will buy the land for RM215.5 million from UDA Holdings Bhd. The land is sited next to the Sheraton Imperial Hotel and behind the Asian Heritage Row. 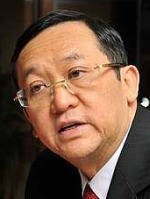 Mutiara Goodyear executive director Cheang Chee Leong said the deal is pending approval of the Finance Ministry. "Our current focus is to complete the transaction of the land. The project has a development order since 2005. It would have to be reassessed as the original plan was done in 2003," he said after the company shareholders' meeting here yesterday. 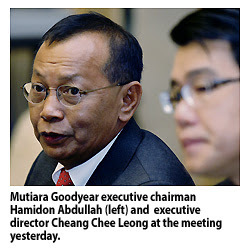 Cheang said Mutiara Goodyear plans to borrow up to RM170 million to fund the deal. "We will borrow about 70 per cent of the RM215.5 million." On whether Mutiara Good- year plans to diversify, executive chairman Hamidon Abdullah said the company will focus on property development. Hamidon joined the board of Mutiara Goodyear following the takeover of the company by Atis Corp Bhd. In September 2010, Atis Corp and wholly-owned subsidiary Atis IDR Ventures Sdn Bhd took over Mutiara Goodyear. As at April 22 this year, ATIS IDR Ventures Sdn Bhd owned 60.8 per cent of Mutiara Good- year. At the AGM, shareholders approved the proposed name change to Nadayu Properties Bhd. This will be formalised in two weeks to better reflect the change of new management and company branding strategy. Hamidon said the company will launch several projects, mainly residential, worth RM1.3 billion in gross development value by the end of the year. Among the upcoming launches are Nadayu 28 Sunway, Nadayu 290 Penang and Nadayu Cyberjaya. Currently, Mutiara owns 347-ha of land, of which 68.4ha is in the Klang Valley, while the balance is in Penang. JOHOR BARU: Global Asia Assets (M) Sdn Bhd (GAAM) sees Iskandar Malaysia as offering good prospects to Japanese looking to invest in property development projects outside their home country. Chief executive officer Fujimura Masanori said the company planned to bring more Japanese investors to invest in the Iskandar Malaysia property market. He said Johor Baru or Iskandar Malaysia still had ample land for future developments with the prices of properties here still cheaper compared with Kuala Lumpur and Penang. Fujimura said since setting up its office here last September, about 300 of its Japanese clients had visited Johor Baru and many had shown strong interest to invest in the property market in Iskandar Malaysia. “They are attracted to Johor Baru's close proximity to Singapore which is a popular destination among Japanese and also the long term prospects of Iskandar Malaysia,'' he told StarBizWeek. Fujimura said this after signing a memorandum of understanding (MoU) with United Malaysian Land Bhd's subsidiary Seri Alam Properties Sdn Bhd at the Wealth of Iskandar Malaysia Conference recently. Seri Alam Properties will develop 110 units of bungalows on an 8.09ha site overlooking a lake in Bandar Seri Alam township in Pasir Gudang with a gross development value between RM200mil and RM400mil. The project is known as Japanese Holiday Homes with each bungalow having a built-up area of 2,200 sq ft and a land size of 4,500 sq ft with its own swimming pool and a club house. GAAM is a subsidiary of Global Asset Asia Investment Ltd (GAAI), a holding company incorporated in Hong Kong whose clients are mostly high net worth Japanese investors. “It (the group) has 10,000 cash-rich Japanese clients who are serious investors and always on the look-out to enhance their investment portfolios,'' said Fujimura. GAAM general manager Takahiro Sakanoue said this was the company's second purchase in the Johor Baru market after the acquisition of two high end luxury condominium blocks of Molek Pine 3, in Taman Molek for RM200mil early this year. The 28-storey tower block consisting of 212 units and a six-storey block with 36 units, are being developed by Tanjung Bintang Sdn Bhd, which comes under Berinda Group, a property development arm of Kuok Group. On the bungalows at Seri Alam township, he said it was impossible to get a bungalow of similar size in Tokyo as the city was already densely populated. Takahiro said a similar bungalow located in the suburbs of Tokyo, about 30 minutes by train to the city centre and minus the lake view, cost a whopping RM37mil each, and a that bungalow in an area about one hour's train ride from the city would sell about RM19mil. 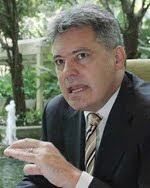 “Our clients love properties in Johor Baru as they are considered bargains for them,'' he said. Takahiro said Johor Baru was well known to the Japanese after the country's soccer team qualified for the World Cup after beating Iran at Larkin Stadium here in 1997. He said Iskandar Malaysia would also be a good location for Japanese manufacturers planning to relocate their operations elsewhere in view of the natural disasters in Japan, such as earthquakes. Takahiro said the company would be looking at several options when investing in property projects in Iskandar Malaysia, including having joint-ventures with local partners, buying the properties en bloc or acquiring certain equities in companies. Other than Malaysia, GAAI has similar investments in Canada, China, Cambodia, Europe, Hong Kong, Japan, Macau, Thailand, USA and the Philippines. DH Flinders Ltd, a specialist Asia-Pacific corporate advisory practice that focuses on real estate, financial services and small capital sectors, sees good investment opportunities in Islamic real estate investment trust (REIT) in Malaysia. Executive director Stephen Hawkins says Malaysia already has a good start in terms of Islamic REIT awareness, having established the guidelines for this type of investment. “Malaysia has syariah guidelines and syariah REIT guidelines, so there's already a formal structure that provides fund managers and operators a structured environment to work within. “It also provides the regulators with an environment to regulate and investors will be able to see clearly how things will be structured and run in this market,” he tells StarBizWeek. DH Flinders has offices in Australia and Singapore. In November 2005, the Government, through the Securities Commission (SC), issued guidelines for Islamic REIT, setting a new global benchmark for the development of Islamic REIT and making Malaysia the first jurisdiction to introduce such guidelines in the industry. According to Bursa Malaysia website, presently, Malaysia is the only government to establish such guidelines for Islamic REIT. The guidelines facilitate the creation of a new asset class for investors and provide new opportunities for market players, including fund managers, to further diversify their investment portfolios. “Malaysia has an advantage over the rest of the region because it has taken the time to put those guidelines in place,” says Hawkins. On a global level, Hawkins believes that there is a large, untapped market for Islamic REITs. Malaysia, he says, is in a good position to benefit with its established guidelines in place. “From a Malaysian context, Malaysian people and Malaysian funds are already comfortable with syariah-compliant REITs. Hawkins notes that by having an established conventional REIT market in Malaysia, both local and foreign investors would be confident in diversifying their investment portfolio into Islamic REIT. According to Bursa, there are 13 REITs being offered in Malaysia now, including two Islamic REITs. Al-Aqar KPJ REIT is the first Islamic REIT in the world while Al-Hadharah Boustead REIT is the first Islamic plantation REIT. Both Al-Aqar KPJ REIT and Al-Hadharah Boustead REIT rank among the top-three REITs in Malaysia in terms of dividend yield, according to information on the local bourse's website. “There are already (Islamic REIT) vehicles out there, but I believe there's a lot more market appetite for this type of products,” Hawkins says. According to SC guidelines on Islamic REITs, rental incomes are derived from permissible business activities conducted according to syariah principles. In the case where a portion of the rental is from non-permissible activities, then these rentals shall not exceed 20% of the total turnover of the Islamic REIT. An Islamic REIT is not permitted to own properties where all the tenants operate non-permissible activities. With more stringent guidelines (as opposed to) conventional REITs, Islamic REITs usually comprise investments in industrial properties. This is because industrial properties are the easiest of the property sub-sectors to assess and to ensure that they are syariah-compliant, says Hawkins. “Most industrial facilities, even if they're multi-tenanted, you kind of know what they're doing and it's easy to asses or judge. But a lot of industrial properties are single tenanted anyway. Essentially, properties that are syariah-compliant would need to operate under circumstances where it is not contrary to syariah law. These include gambling activities or the selling of alcohol, tobacco-related products and manufacture or sale of non-halal or related products. “Fundamentally, industrial properties (tend to be more) compliant with the syariah guidelines,” says Hawkins, adding that industrial properties are capable of generating good and stable yields. “From my perspective, for the industrial sub-sector, the buildings may not be the trophy assets. They're not going to be the largest office tower or the newest shopping centre in a city. Hawkins also says that the industrial property sector is not subject to huge upswings and downturns experienced by other property sectors. “Demand for industrial space is essentially linked to economic activity. Asia is in the middle of a big growth cycle and the world is starting to recognise that Asia is where that growth is, and industrial property is a proxy for that growth. LBS Bina Group Bhd's wholly owned unit, LBS Bina Holdings Sdn Bhd (LBSBH), has agreed to buy the remaining 35 per cent stake in its subsidiary, Astana Modal (M) Sdn Bhd (AMMSB), from one of its directors for RM25.8 million. LBSBH currently holds 65 per cent stake in AMMSB and wants to gain full potential earnings derived from the D'Island Residence project. It is a self-contained township with an estimated total gross development value of RM2.9 billion. AMMSB is the joint developer of the D'Island project together with Kumpulan Darul Ehsan Bhd. PETALING JAYA: AmFIRST Real Estate Investment Trust (AmFIRST) hopes to grow its asset size by a fifth annually, predominantly comprising acquisitions of office buildings. As at March 31, its total asset size stood at RM1.02 billion. The assets are managed by Am ARA REIT Managers Sdn Bhd. By September this year, it would have grown its asset size by 13 per cent as it completes the purchase of two office buildings in Cyberjaya valued at RM133 million. This will bring total assets under its management to RM1.16 billion. 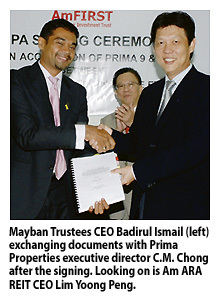 Yesterday, Mayban Trustees Bhd - on behalf of AmFIRST - signed a deal to buy Prima 9 and Prima 10 office buildings in Cyberjaya for RM72 million and RM61 million respectively from Complete Event Sdn Bhd, confirming a Business Times article. Complete Event is part of Prima Group of Companies. Am ARA REIT Managers chief executive officer Lim Yoon Peng said the purchases will contribute gross revenue of RM12.68 million in the first year. Together the properties have a net property yield of 7.8 per cent and a distribution per unit of 0.68 sen in a year. "We are hoping to give a marginally higher dividend than 9.75 sen (given) last year (to our unitholders)," Lim told reporters at a press conference. He added that it would also hinge on whether borrowing costs go up further. The acquisitions will increase its total net lettable area by 9 per cent to 2.56 million sq ft.
Average occupancy of eight buildings will improve to 88.10 per cent from 83.57 per cent from six buildings. The latest acquisitions will be financed via borrowings. Accordingly, the group's gearing will reach 45.84 per cent of total assets. This means that it can still make purchases to the tune of RM92 million without having to raise any funds. AmFIRST's six properties include Bangunan AmBank Group, Menara AmBank Group and AmBank Group Leadership Centre in Kuala Lumpur. In Petaling Jaya, it owns Menara Merais, Kelana Brem Towers and The Summit Subang USJ. PETALING JAYA: Olympia Industries Bhd is disposing of 15.25 ha of freehold land in Johor Baru for RM80mil cash to Adawan Development Sdn Bhd in order to reduce its debts. It told Bursa Malaysia yesterday that the land was acquired in December 1989 and was an unconverted development land zoned for residential and commercial use located about 5km north-east of the Johor Baru city centre. The group said the land was one of several earmarked assets which had been identified as a significant divestment asset subsequent to the implementation of Olympia Industries' restructuring scheme to meet its obligations under the said scheme. “The proposed disposal is to comply with the terms of the restructuring scheme, specifically to substantially reduce the debts owing to the primary holders of 2007/2013 six-year irredeemable convertible bonds which are the original lenders under the scheme,'it said. It added that the consideration for the proposed disposal was a willing-buyer willing-seller basis and based on the valuation carried out by Messrs CH Williams, Talhar & Wong on June 3. CH Williams, the designated valuer of the lenders had assessed the market value of the land at RM73mil.